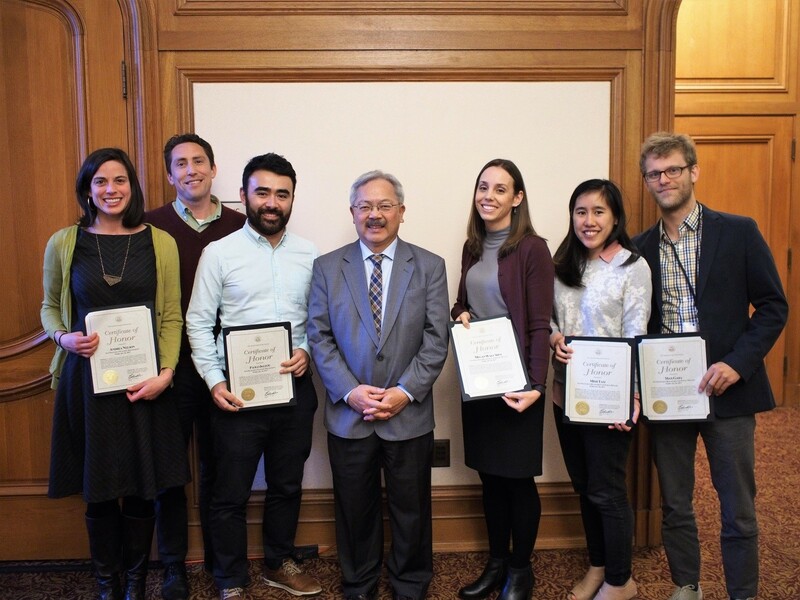 SFDPH PHES staff Meg Wall Shui and Mimi Tam and their partners from SFDPH Policy & Planning, SF Planning and the Mayor’s Office of Economic and Workforce Development were honored by Mayor Edwin M. Lee at a lunch on February 16, 2017 as a part of San Francisco’s first City Data and Innovation Awards for their innovative work on the Central Market/Tenderloin Data Portal. The project is a collaboration with St. Francis Memorial Hospital and its Foundation; staff Will Douglas, Abbie Yant, Jennifer Kiss, and Jennifer Lacson, from the Tenderloin Health Improvement Partnership, have been instrumental in bringing this project about. We were excited to have the project - which embodies our core principles of advancing health and equity utilizing data in partnership with city and community stakeholders - acknowledged in this forum. Pictured, left to right: Andrea Nelson, SF Planning Department; Juan Carlos Cancino, SF Mayor’s Office of Economic and Workforce Development; Paolo Ikezoe, SF Planning Department; San Francisco Mayor Edwin M. Lee; Megan Wall Shui, SF Department of Public Health; Mimi Tam, SF Department of Public Health; Max Gara, SF Department of Public Health.